In addition to our catered chalet, we also have a spacious chalet-style apartment, within the same building. The apartment can be rented on a self-catering basis, or used as additional bedrooms, to accommodate larger catered groups. TThe apartment has three large bedrooms, each with an en suite bathroom, and can sleep up to 8 people. 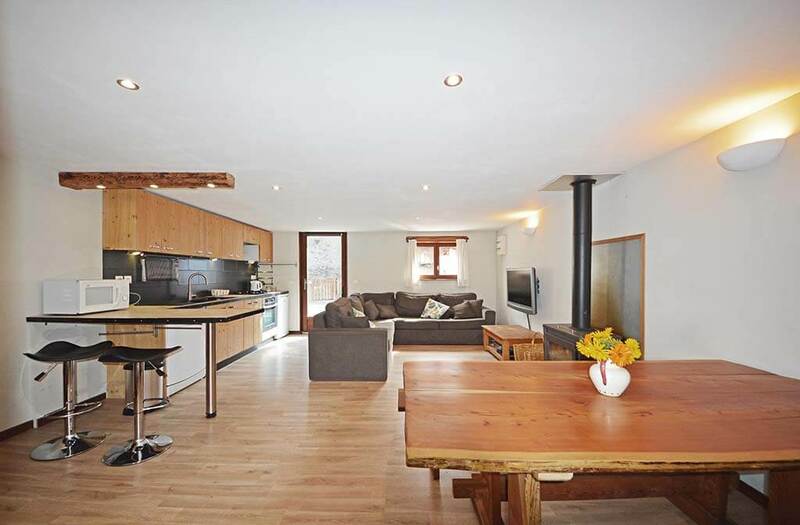 The living area is open plan, with a fully equipped kitchen, dining area and lounge with a log-burner. The apartment is equipped with a widescreen TV (UK channels), DVD and free WIFI access. The free resort shuttle bus stops 50 m from the apartment and a 3 minute bus ride takes you to the Peisey open-air cable car, which links up with the main resort (Vanoise Express cable car and high speed 6 man chairlift). There is free parking available if you arrive by car.